Ryanair says it has cancelled 190, or about 8% of its 2,400 scheduled flights this Friday. 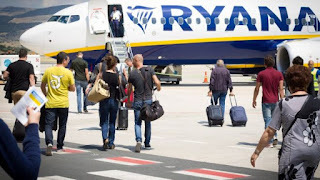 The airline has adjusted its schedule in the face of strike action being taken by unions in Spain, Belgium, Holland, Portugal, Italy and Germany. The Irish airline says this will affect 30,000 passengers, who have been notified by text and email. The long-running industrial action by Ryanair staff centres on working conditions. Ryanair says it "sincerely regrets these unnecessary customer disruptions", which it blames on agitation from competitor airlines. Workers based in countries other than Ireland are unhappy that Ryanair has been employing them under Irish legislation.